A brilliant green emerald, with an excellent rich green grass color, from the mines at Muzo and Chivor (Boyaca-Colombia), transparent, with just very minor inclusions, it measures 12.8×10.4mm. 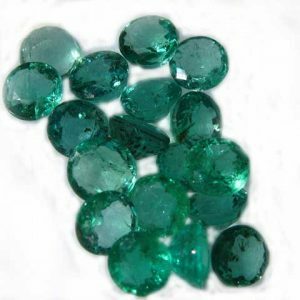 The thing that intrigued me about this emerald more than anything was its grass green color and few inclusions, so fare that combination in even a small emerald, so find it in almost a 6 carat was quite remarkable. So rare to find an emerald this clean. What a sparkler. This emerald has been certified by the AGL gem lab.